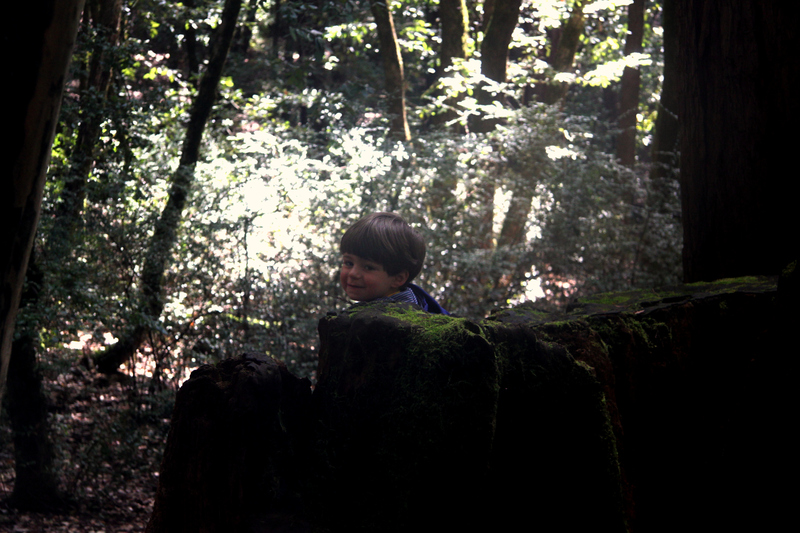 Last week we spent some time camping in beautiful Butano State Park and absolutely loved it. It’s a quiet, secluded, rugged valley perfect for families with preschoolers and has lots of places for little ones to explore. Butano effectively has two campgrounds: a car camping area and a series of sites that are ‘walk-in’. The car camping area is pretty typical for a California state park: the sites are reasonably spaced, there are clean bathrooms with hot and cold running water, and several water stations with potable water. The usual state park rule applies when booking–if you want privacy, always pick a site on the outside of the loop. We stayed in the ‘walk-in’ area which I thought was really lovely. The sites there were a little mixed in size and privacy, but some of them were gorgeous and pretty isolated for a state park. Booking is a bit of a lottery as sites are assigned by the staff, but there weren’t any really terrible ones. The ‘walk-in’ element to this camping is not very arduous. Our site was one of the more private ones furthest from the parking area and we were able to cart all our gear quickly and easily with the help of a hand-cart. The facilities in this area of the park are more basic. There are a couple of drinking water stations and one pit toilet. It’s certainly not for those who like ‘glamping,’ but it is a really nice way to get a small taste of more ‘wilderness’ camping with little kids in tow. Just bring some hand sanitizer and be prepared to be dirty. It also seems to attract a more outdoorsy type of camper, so if you’re looking for a quiet, relaxing weekend, it’s the place for you. One of the nicest aspects of the walk-in section was the absence of cars and bikes which made it possible for little ones to wander round and explore in greater safety. The camp staff were very friendly and helpful, but the critters were quite aggressive. I’ve camped in many places and never come across raccoons as bold as Butano’s. My tip is to secure food and anything scented in the bear box at all times, even when you’re sitting around camp. These raccoons are not afraid of people. In addition, the park currently has some issues with wasps nesting in the rotting tree stumps around the campground. I have to say that we weren’t bothered at all by wasps, but it’s a good idea to keep a closer than usual eye on your kids when they’re scrambling about the woods there and to warn them of the potential wasp danger. Finally it’s worth noting that there’s not much for sale here apart from firewood. Make sure to pack-in everything else you’re going to need. What’s there to do in Butano? 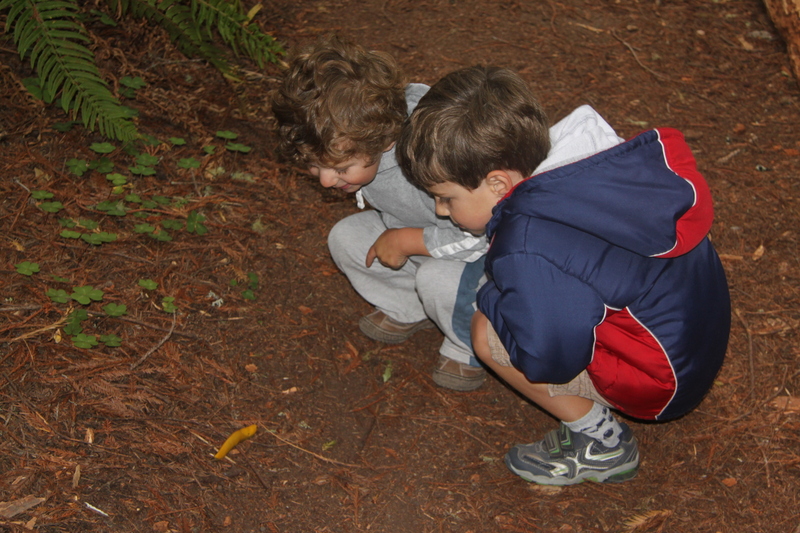 There were lots and lots of banana slugs. If your preschoolers are anything like mine, this is a huge plus. We found 70 in 24 hours. There are also birds a-plenty, deer, raccoons and a few California newts. And plenty of weird and wonderful woodland bugs. 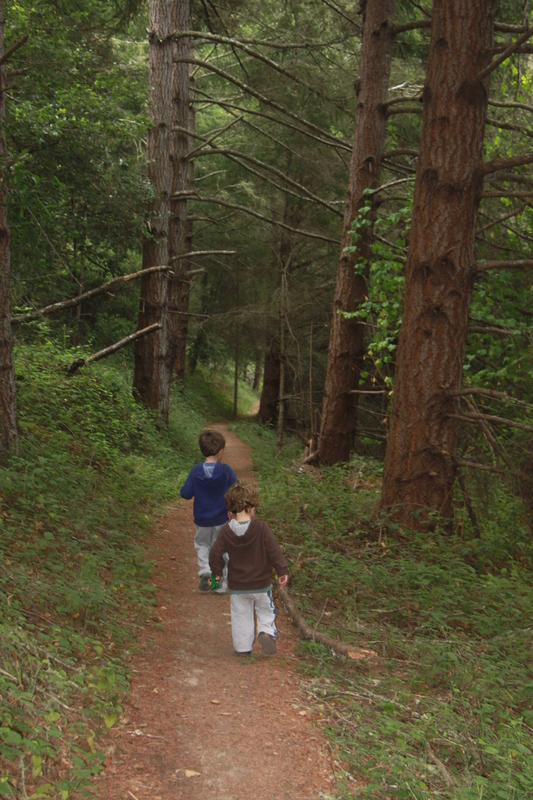 I have to add a warning that, in Butano, unlike some other local parks, there are no super-easy, 1/2 mile, paved walks. 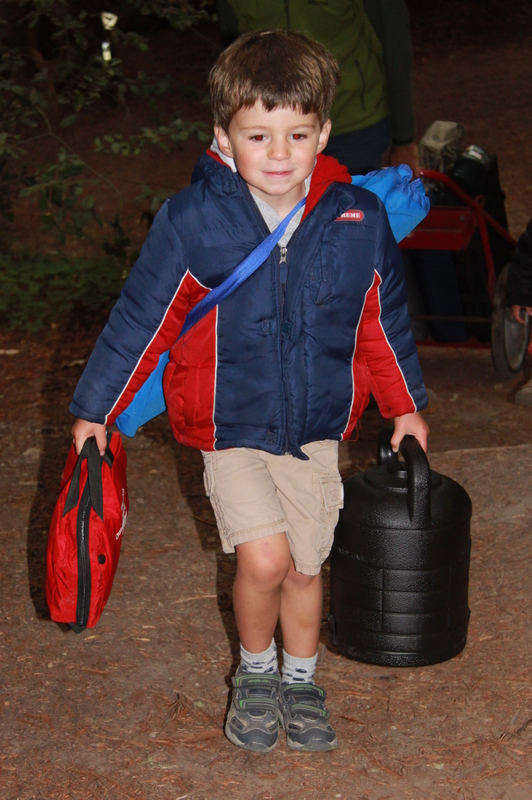 It’s probably not the place to come for your preschooler’s first hiking experience. That said, there are a few fun loops and trails for the more seasoned little one who is able to handle a couple of miles. We must have covered about 8 miles on three separate hikes, all of which my 3 year old walked and most of which my 2 year old walked. These trails are not jog-stroller friendly and you’ll need a backpack or child carry for non-walking infants. We, and especially The Monkey, loved The Six Bridges Trail. We took the path from the Ben Ries campground to the visitor center and back, a little over two miles. It’s mostly flat, but there are a couple of short, steep climbs. 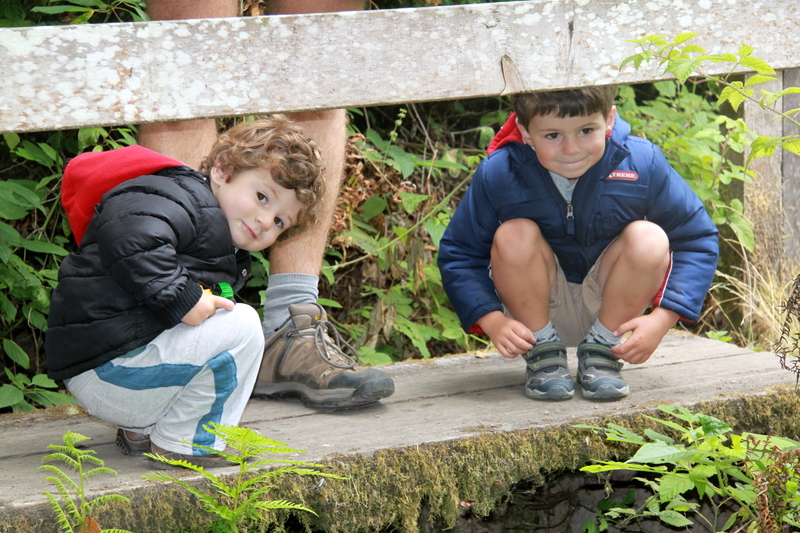 This is an especially fun walk for preschoolers as they love counting the bridges and watching out for newts. We also tried the Goat Hill Trail Loop and the Jackson Flats Trail, both of which were narrow and windy, with a few scrambly areas, but which could be completed by our two year old without much difficulty. Now we can’t wait until the kids are old enough to go all the way out to the Trail Camp for a back woods overnight stay. It’s small and fairly limited for adults, but the kids wanted to visit twice. They really liked looking at the topographical map/model, especially at the end, and plotting all the walks they’d done. 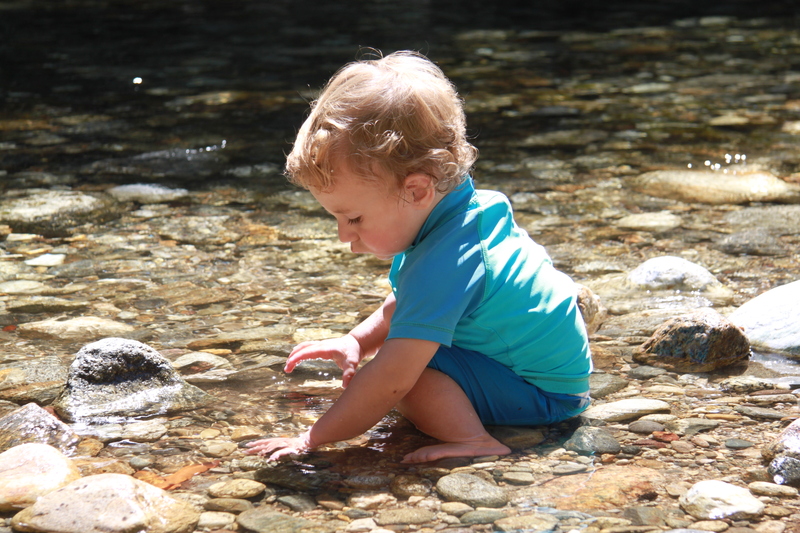 There are plenty of spots where you can easily access the shallow Butano Creek and our boys had fun playing there. We had a really lovely weekend at Butano. The campground was more beautiful and quieter than the average state park and the empty trails were appealing to the kids–challenging without being too hard. This might well become one of our regular camping destinations. I’m pleased to announce that camping season is now underway! Last weekend we decided that the evenings are sufficiently warm to take the boys out overnight and headed to Big Basin Redwoods State Park with a couple of other families for two nights in the woods. This was an unusually luxurious trip for us as we stayed in the park’s tent cabins rather than in our little tent. And it was a lot of fun. The park itself is stunning. After the winding approach (and, be warned, 236 is windy enough to make kids car sick!) you feel as if you are in the middle of no-where when you finally reach the park headquarters. All around are towering redwoods and sunny forest glades. The campsites themselves are great – some of the nicest we’ve seen in a state park. Each site is well set apart, spacious, private and characterful, with its own arrangement of redwoods, stumps and logs to be explored. The amenities are pretty good: hot and cold running water, coin operated showers, a ranger station selling camp basics, and even a coin operated laundry. The only real down-side is the super-aggressive squirrels: don’t keep any food in your cabin or tent unless you want visitors. Big Basin is enormous and has miles of interesting hiking that is just too long and too remote for little legs. But it also has some great trails for small people. 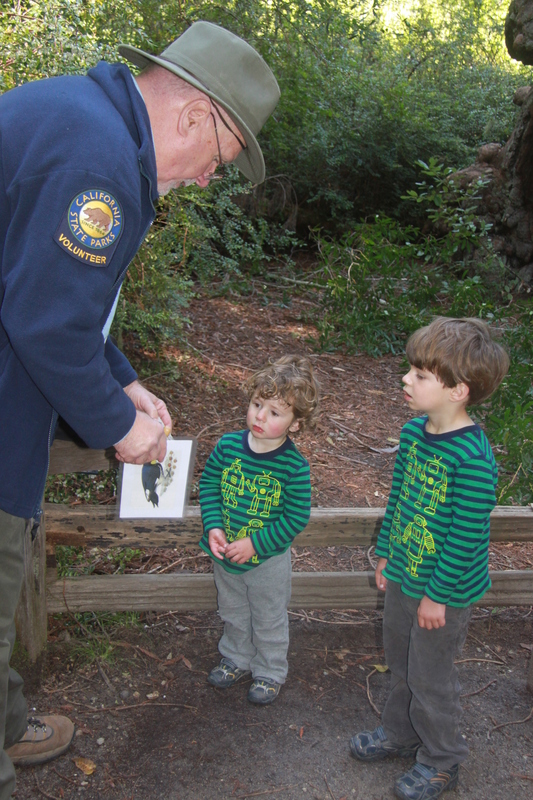 The weekend docent-led ramble along the Redwood Loop Nature Trail that leaves from the park HQ is perfect for toddlers. The path is wide, flat and fairly even, and winds past some interesting sights that appeal to little ones. Our ranger, Norm, was really informative and pitched his talk to the adults or the kids in turn, or to whichever combination happened to stay still at each spot on the way. He was knowledgeable and unflappable amidst the toddler chaos. Even the Puppy Dog learnt something: at the end of the hike he pointed to a redwood and said, in a rather serious voice, “tall tree Mama!”. It was amazing to see near 2000 year old trees, to learn about the forest ecology and about the cultural history of the park (did you know there used to be a dance floor and swimming pool there under the stars?). We also enjoyed the route along the creek from the Huckleberry Camp ground. It was narrow in places, and the drop precipitous on one side, but the kids loved watching the white water and looking for bugs. We simply headed down the trail awhile, and turned back when they’d had enough. What’s really great about this campsite, though, is the possibility for unstructured outdoors play. 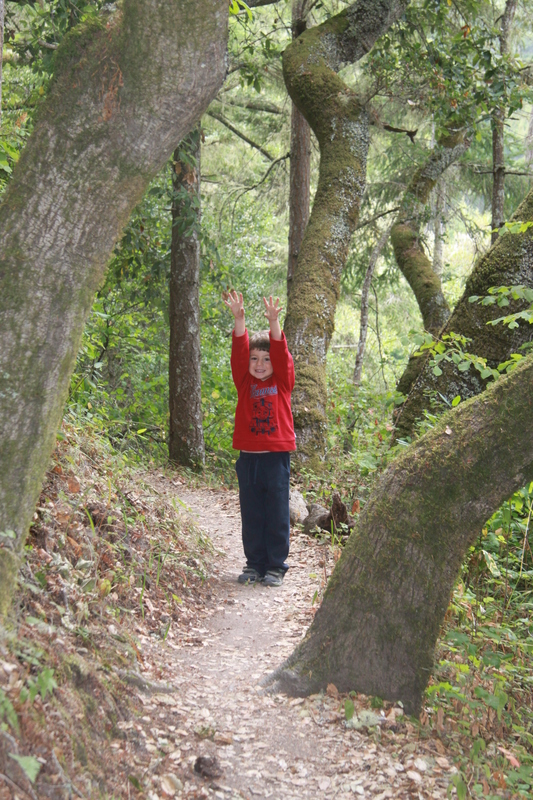 Our kids were happy wandering around our campsites and exploring the forest that backed onto our cabins. There were slugs to find, trees to climb, forts to make, log trains to be fixed and driven, games of hide and seek to be had. The list goes on. It was nice to let them wander free in a pretty safe environment and to have their own adventures while we watched from our camp chairs. The park comes highly recommended as a toddler destination, and we’ll be back. Depending on what you’re used to, these are either the height of luxury or beyond basic. To us, used to rocking up after sunset, pitching a tent in the dark and trying to fire up the camp stove for supper while placating over-tired kids, it was wonderful to arrive and find linens on the bed, a lantern and propane set up for our use, fruit juice, towels and toiletries awaiting us .The cabin had everything we needed for the weekend and, depending on which package you choose, can also come with cooking equipment, a freezer box and ice. The cabins themsleves were pretty clean and well maintained. See here for details and rates in case you want to book. Bottom line for me – the cabins do make things easier if you have kids, but I did miss our little tent. 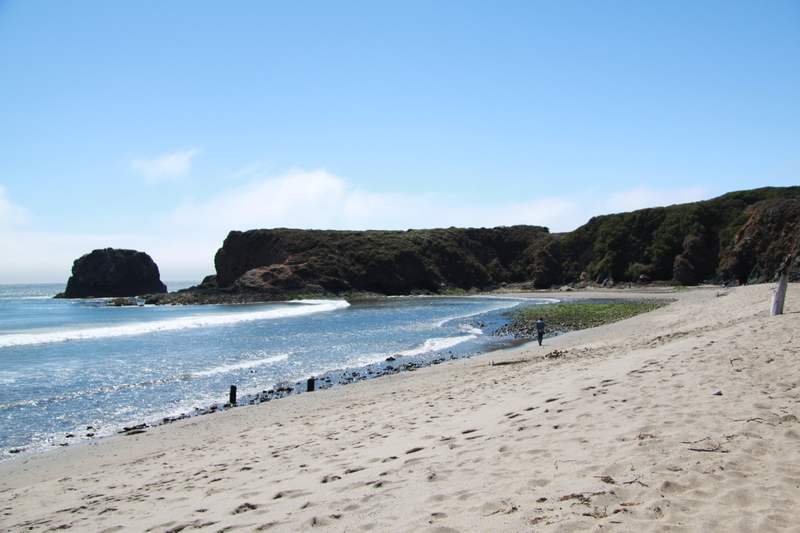 Since arriving in North Cali I’ve been amazed by the lack of information on local beaches, especially when they are so varied and so beautiful. On the other hand, it’s been (mostly) fun discovering them for ourselves and working out which are the most suited to toddlers. 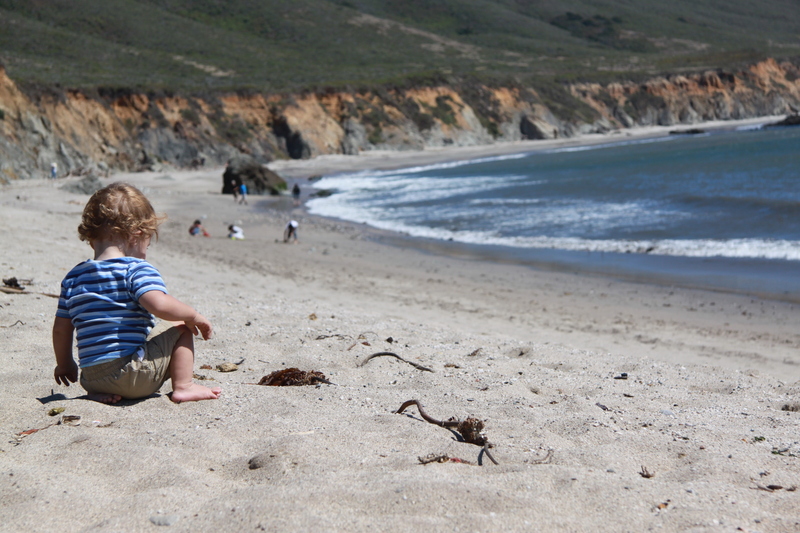 The beach at Andrew Molera State Park, where the Big Sur meets the Pacific, is one of our favourites. It’s a long and super clean sandy beach, covered in driftwood (which the boys love) and nearly always empty, even in the height of summer. I think the mile-long hike out to the shore limits the number of visitors, though for our boys that’s part of the fun as the path winds through varied terrain and abounds with snakes and lizards (keep an eye out for rattlers!). And the walk is well worth it. Park at the trail-head for a $10 fee (although it’s free if you are camping at a local state park) or park on highway 1 for free and hike in. Bring an ergo or backpack for very small children. The beach itself is fairly windy, so dress accordingly. 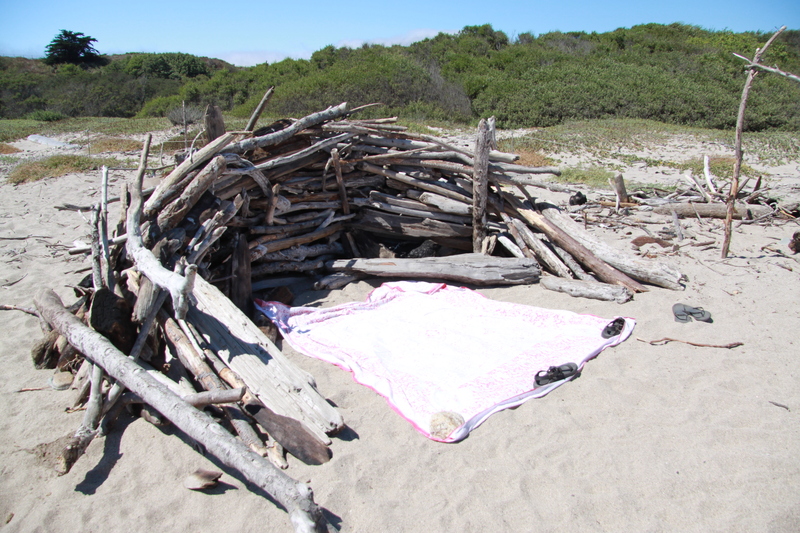 There are some awesome driftwood ‘wind-break’ structures to shelter behind however. Go at low tide and there are rock pools to explore and rocks for scrambling along at the mouth of the Big Sur. An inner-tube would be fun to ride the Big Sur out to the Pacific. If you like riding, there are stables nearby offering pony treks along the shore. There is a campground near the beach that we haven’t yet tried, but which seems to be popular. It’s first come, first served and you’re advised to arrive early friday morning to secure a site for the weekend. All sites are ‘walk-in’ but the campsite does have some very basic amenities, though not much shade or shelter. We made our annual pilgrimage to Pfeiffer this weekend. It’s a gorgeous campground that quickly became a family favourite and regular summer ritual after we first visited in 2009. 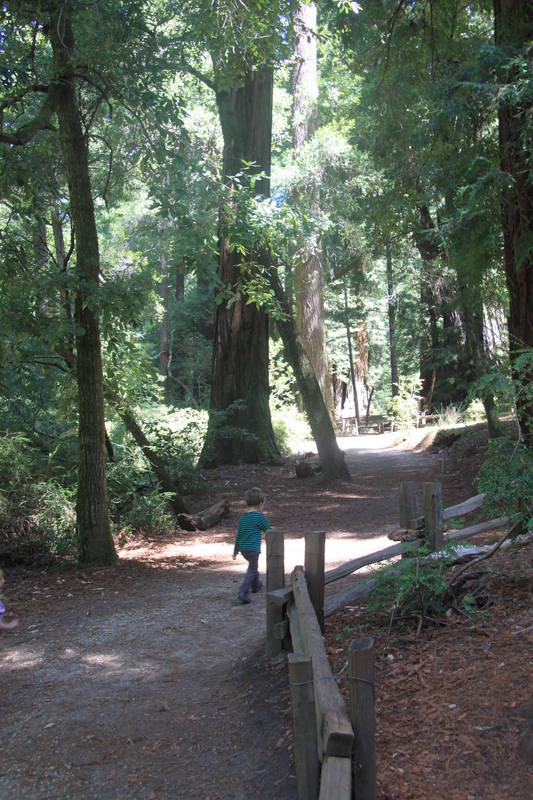 Generally, we like to spend the summer exploring new parts of North California, but sometimes it’s nice to return to a beautiful and familiar spot, especially when it’s so particularly suited to camping with small children. What makes this park so special? It’s a beautifully, but unobstrusively, maintained state park with some of the nicest campsites we’ve encountered. Most of the plots are relatively large, and some are so secluded that you can forget you’re in a campground while still having the convenience of car camping and state park amenities (toilets, showers, running water, trash cans etc). Set in a sheltered valley on the Big Sur it has a wonderful, shallow river for kids to play in and lots of open forest space to explore. Plus there are beautiful beaches, pony-riding and hiking nearby. Lots to keep the kids occupied. 1. The dust. Pfeiffer in the summer is exceptionally dusty and small children will end up covered in dirt. Luckily, there are coin operated showers on site and the Big Sur river to clean off in, but be sure to dress your kids in old clothes. 2. The individual campsites vary considerably in size, exposure and privacy. Generally, the sites in the center of each loop are fairly open and sometimes quite noisy on the weekends. If you like peace and seclusion, opt for one of the many sites on the edge of the campground or along the road. While most of the sites are shaded, those in the direct vicinity of the campstore are very exposed and can get brutally hot during the day. On the whole, however, the sites at Pfeiffer are significantly larger than those encountered at many state parks and can comfortably fit two families (although note there is an 8 person per site maximum). 3. 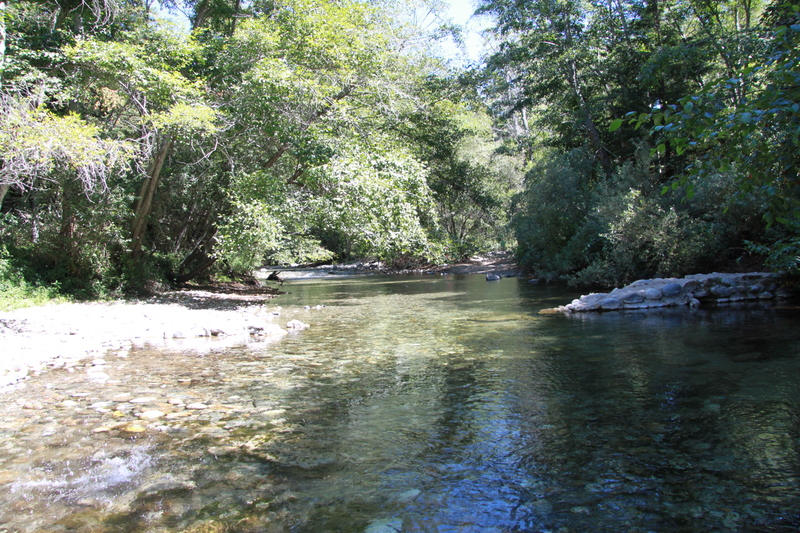 Some sites sit on the banks of the Big Sur with direct access to the river. We loved this, but if you’re nervous about having your kids so close to the water, choose a site deeper in the woods. Incidentally, we’ve never had any trouble with mosquitos near the river, but it’s probably worth bringing some repellent if you react badly to bites.